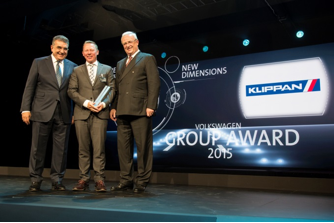 Klippan Safety AB, Europe’s leading developer and manufacturer of complete storage and bed systems for commercial vehicles, announce that they have been honored with ”Volkswagen Group Award 2015”. An award which is yearly honored to the best suppliers of Volkswagen AG; the world leading automotive manufacturer. The award-winners are distinguished by their innovative power, product quality, development competence, sustainability and professional project management. Dr. Ronnie Törnqvist, CEO Klippan Safety AB (centre), receiving the award from Prof. Dr. Martin Winterkorn, CEO Volkswagen AG (right) and Dr. Francisco Javier Garcia Sanz, Director of Purchasing Volkswagen AG (left), at the award ceremony in Neuburg, Germany.